Nancy Drew looks pretty good for a gal who's been around for nearly 90 years (she made her debut in 1930). And judging by the release of this week's Nancy Drew and the Hidden Staircase, starring Sophia Lillis as the amateur sleuth, it doesn't look like she's slowing down anytime soon. Here are a few facts about the girl who paved the way for Velma Dinkley and Veronica Mars. 1. nancy drew could have been diana dare. Can you imagine being addicted to a book series starring Diana Dare, Stella Strong, Nan Nelson, or Helen Hale? Those are just a few of the names Nancy Drew creator Edward Stratemeyer pitched before landing on Nancy Drew. The first choice was Nan Drew, actually, but his editors thought lengthening the name to "Nancy" made it roll off the tongue a little better. 2. Edward Stratemeyer wrote the plot outlines, but hired someone else to do the actual writing. And no, that ghostwriter was not Carolyn Keene (that was just a collective pseudonym used over the years). In the earliest days of the series, the woman behind the pint-sized heroine was Mildred Wirt, who was reportedly paid between $125 and $250 for each book she wrote, plus one-fifth of the royalties. Wirt didn't write all of the Nancy Drew books, but she did pen 23 of the series' first 25 titles. As such, Wirt is largely regarded as having the most influence on how the character was formed. 3. 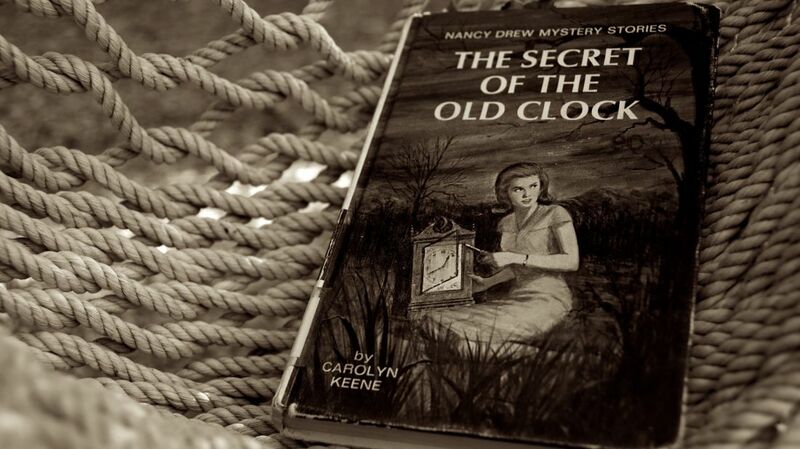 Many powerful women have cited nancy drew as one of their favorite characters. In addition to loving the Nancy Drew books, many of today's most influential women have cited the fictional character as a real-life inspiration for helping them to realize that women could truly do anything. Some of the women in this elite club of Nancy Drew fans include Sandra Day O'Connor, Sonia Sotomayor, Hillary Clinton, Laura Bush, Barbara Walters, and Ruth Bader Ginsburg. 4. Edward Stratemeyer actually felt that a woman's place was in the home. That so many women found inspiration in Nancy Drew is kind of ironic, considering that the series' creator was no kind of feminist. The only reason he created a female detective character was because he had found great success in the young male demographic with The Hardy Boys a few years earlier and wanted to tap into a female audience as well. 5. Nancy drew and the hardy boys weren't the stratemeyer syndicate's only properties. Stratemeyer Syndicate was responsible for a lot of children's book series, so if some series from a certain era seem rather formulaic, well, they were. Other Stratemeyer Syndicate series included The Bobbsey Twins, Tom Swift, The Dana Girls Mystery Stories, and The Kay Tracey Mysteries. 6. In France, Nancy Drew has is known as Alice Roy. She's Kitty Drew in Sweden and Paula Drew in Finland. The book is called Miss Detective in Norway, although inside the book she's still known as Nancy. And in Germany, Nancy is a law student who goes by the name Susanne Langen. 7. Readers weren't too keen on ned nickerson. 8. Russell tandy created the dust jackets and internal illustrations for the first 26 books. While working on Nancy Drew took up a fair amount of artist Russell Tandy's time, it was far from his only gig. He also drew six Hardy Boys covers, served as a fashion illustrator for high-end department stores, illustrated for Butterick Patterns, and designed the Jantzen swimwear logo. Plus, he had friends in high places: he counted Ernest Hemingway, Salvador Dalí, and Norman Rockwell among his nearest and dearest. There's still a major demand for his work today; in 2009, his painting for the cover of the Nancy Drew book The Secret of Shadow Ranch sold for $9500. 9. of the hundreds of nancy drew books published, The Hidden Staircase, is the fan favorite. The second book in the Nancy Drew series, which was published in 1930 and revised in 1949, remains the most popular title in the entire series. As of 2001, it had sold 1.8 million copies, making it #68 on a list of top 100 all-time bestselling children's books. This puts Miss Drew ahead of other favorites such as Eloise, Charlotte's Web, Yertle the Turtle and Curious George. 10. She has gotten more high-tech, but only mildly. There was some talk of updating Nancy for the recent movies, but in the end, it was decided that making her a spy girl with advanced technology and fancy gadgets entirely contradicted the entire being of Nancy Drew. But she has gotten a few timely enhancements: in the recent Nancy Drew: All New Girl Detective series published by Simon & Schuster, Nancy drives a blue hybrid instead of her iconic blue roadster. An earlier version of this article appeared in 2010.